“As I’ve mentioned before, Billur Tekkök and I are editing the digital publication Greek, Roman and Byzantine Pottery at Ilion (Troia). I’ll talk about our work as part of the AIA panel “Web-Based Research Tools for Mediterranean Archaeology“. Sebastian writes that the version for purchase from Lulu.com – the printed version – will ultimately only be an archived version of the constantly changing internet edition, and so he writes, “don’t buy this book”. I was struck immediately by how useful this approach is. There are things I’ve written for various conference proceedings that, anywhere from 3 to 6 years later, still have not come out. So over to Lulu.com I went. This site is one of the print-on-demand variety. You upload your files (formatted according to their specs), and they keep it, with cover art and blurb, in their database. Should somebody purchase it, they print it and send it off. You the author set the price after the printing cost, and Lulu takes a 20% of that as a commission. You’re getting therefore 80% of the profit. Not a bad deal, really. A downloadable version can also be made available, at any price you set. In the spirit of scientific inquiry, I set about to publish my own book. 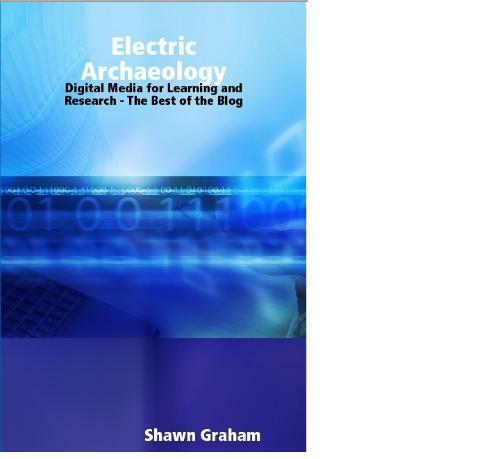 Now, for archaeologists, I can see many advantages to this system- specialist catalogues that wouldn’t otherwise find a publisher, site notebooks, conference proceedings, textbooks, collected writings… I opted to create an archive of this blog. After all, I have no idea *where* in the real world this blog lives. What happens if the server goes on the fritz? I’ve got somewhere around 140 posts, nearly 30 000 words of material. This thing has eaten many hours of my time. I want something to show for all of that effort, just in case… It seemed to me too a good idea to make the download free, because after all who would pay for what they can already get freely by going to this site? It was all quite straightforward. I selected what turned out to be 98 pages of blog postings, organised them thematically, added a table-of-contents, and turned any links into footnotes with the full urls. Then I uploaded it to Lulu, selected some nice cover art, and voila. I’ve purchased one copy to keep on my shelf – an archive of this blog. I might never sell a single copy, but that’s ok. What is a nice benefit though is that people might find it without ever having come across this blog, and so widening my readership. Anyway, if you’re interested, the book lives here. Reading the book brought back memories of my own attempts at world building and playing Civ IV. Yet, Civ IV and I have a problematic relationship. Inevitably It eats my days and nights to the point where it compromises my relationships with other hominids and gives me tendonitis. I thus toss the disc in the garbage and uninstall the program. play Anatomically Modern Humans expanding out of Africa or Neanderthals living in Europe, stretching over 40,000 years with different winning goals to see how they would have interacted. Perhaps we’re on the tip of an iceberg whereby instead of getting up on the board and writing down the stages for intro to archeology, we get people to download a paleolithic game, a mesolithic game, a neolithic game, a rise of urbanism game etc… and have them report back on hermenutic processes as they experiment with different strategies over the course of numerous games. It is certain that a system like Lulu could benefit archaeologists greatly, however I wish the post could go a little more in depth into the process. I am also struck wondering how the source used stating “don’t buy this book”, when concerned with the ever changing nature of digital sources, leads to the conclusions that seem to come to the author. This is not to say that the author’s decision to print his blog does not make sense, just that I can’t see how it comes from the quote given. Overall, This seems a good, though maybe a bit too brief, explanation of Lulu. Inclusion in PDQ might benefit from a conclusion that informs of the reception of this volume, if it has been purchased etc.